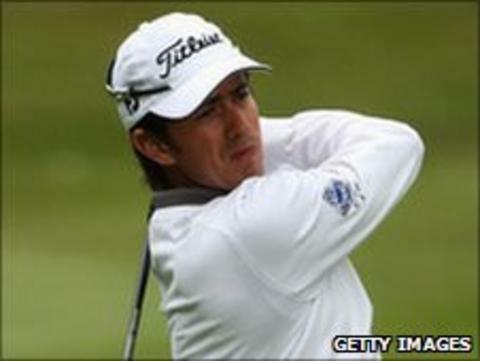 Open debutant Simon Lilly has said a top-20 finish at Royal St George's would be a life-changing accomplishment. The 33-year-old from Wellingborough secured one of the final two qualifying places by surviving a . "Top 20, 25 finish would be fantastic," he told BBC Radio Northampton. "That could change a lot of things in my life and there's no point setting the goal to just making the cut." He added: "I've got a once-in-a-lifetime chance. I may not be here again, so I've got to give it a good shot." Lilly, who has been restricted to mainly pro/am level golf, enjoyed a practice round with Professional Golf Association tour regulars Robert Karlsson, Dustin Johnson and Matt Kuchar around the Sandwich course on Monday. He will tee-off on Thursday, paired with Chris Tidland and Neil Schietekat. "I can imagine the pressure will be pretty high," he said. "Even on the practice round, I was a little bit nervous, which was great. I wanted to get a good draw in the practice round to get the nerves going."